Decorium is very proud to introduce exclusive handmade home décor accessories. 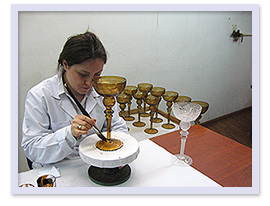 Every item is handmade, of exceptional quality, and most adorned with 24 karat gold or 24 karat platinum. The collection includes stunning stemware, striking contemporary pieces, and exquisite art glass representing historic Anatolian civilizations. Designing, etching, painting, and stone application is all done by hand. The last step is the 12 to 14 hour baking process adhering the paint and stones to assure the utmost quality and durability. The skill that each artist applies to every piece to create this beautiful handmade glassware makes one truly appreciate the outstanding quality and magnificence of this collection. Every piece of this Glassware is a treasure to behold and will make a statement in your home or office. Iznik, formerly called Nicaea, located in the region of Western Anatolia, was an important center in the Roman and Byzantine eras. Conquered in 1331 by the Ottoman Turks, Iznik became famous for its ceramic ware throughout the 14th and 17th centuries, when Istanbul became the center of the Ottoman Empire. Iznik Ceramics are admired around the world and original Iznik tiles can be seen in the British Museum, Le Louvre, the Sevres, the Istanbul Archaeological Museum as well as many historical buildings in Istanbul. The quartz ceramics are still intact 600 years later. 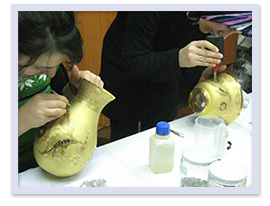 Iznik ware is primarily made from quartz, a semi-precious stone, giving the ware extreme durability. 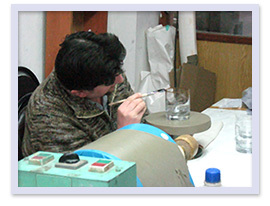 Each piece has a high quartz content, 80%-90%, that is fired at twice at 2372°-2462° Fahrenheit. 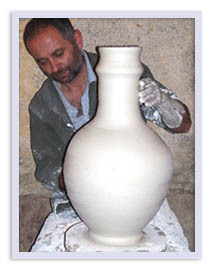 The production techniques are very complex making the finished product valuable and unique. 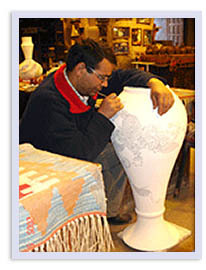 It can take up to one year to complete a single item, each intricately hand painted by the master designer and signed. Due to the high quartz content in Iznik ware, it is not affected by temperature changes and it will last for hundreds of years. 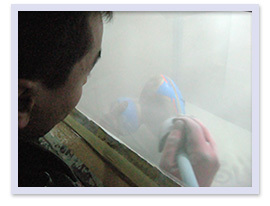 The hand painted designs are protected under the glaze and will not fade. 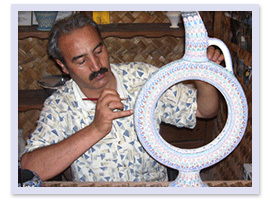 Iznik ware is not to be confused with mass produced ceramics that are made with clay and do not have the same everlasting quality. Today, Firca quartz ceramics are used in old and modern buildings by discriminating decorators, architects, and art lovers.